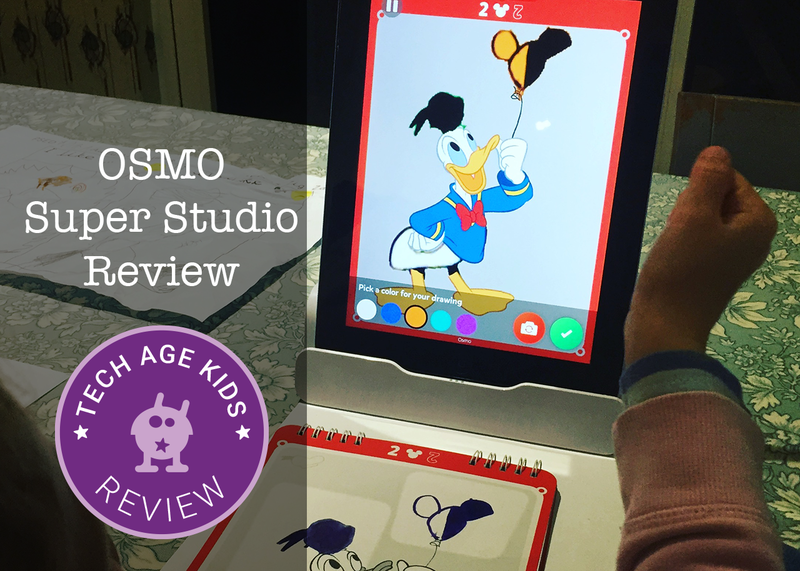 This is a review of OSMO's Super Studio Mickey Mouse and Friends pack. OSMO also make 'Disney Princesses' and 'Incredibles 2' Super Studio packs, sold separately. Disclaimer: This set was sent to us by OSMO to review, all opinions are our own. OSMO Super Studio contains one Super Studio Marker, a Super Sweeper and a Mickey Mouse and Friends Super Sketchpad. You are advised to use only the Super Studio Marker with the Sketchpad, as other 'art supplies' (I'm assuming they are referring to other makes of dry wipe/ whiteboard pens) will stain the Sketchpad; we have not tested this. Apparently there are different colour Markers available, and they do gradually fade and disappear from the sketchpad, even if not wiped off (hence why they are recommended rather than other pens). You are also told to wet the Super Sweeper (flannel) which actually does a really good job of cleaning each Sketchpad Page once you are done (they recommend that each page is cleaned immediately after use). The Sketchpad itself is made from thin plastic type pages that are durable and water resistant; this should ensure long life and multiple re-use. It states on the box that it is for Ages 5+. I found this to be about right, although the upper age is probably only limited by the user's appreciation of the characters involved, as the art can be as detailed/ simple as the user wants it to be. For this to work, you obviously need the standard OSMO hardware package which includes an iPad stand and camera reflector (as shown here). As our iPad is now a little old (iPad 2) it took a long time to go through the process of downloading the OSMO app, setting up and account, making sure the iPad is charged (our slightly older longer charging cable doesn't fit in the stand, but the standard charging cable that comes with this model of iPad should fit in the stand so you can charge it while using). 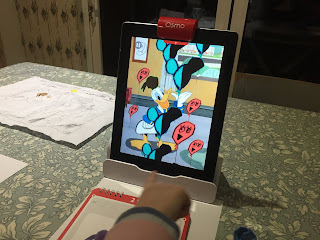 The native OSMO app seemed to be quite CPU intensive and was very sluggish on our iPad, making introducing it to the children quite difficult. They lost interest as it would take about a minute to boot up and even longer to switch between the Masterpiece and Newton games. 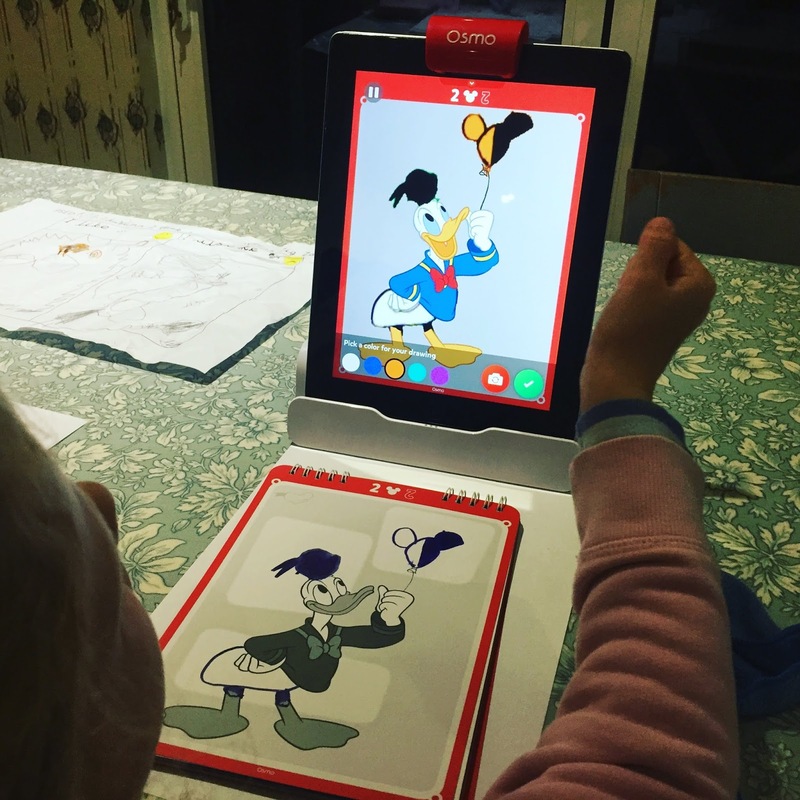 However, the standalone Super Studio Mickey Mouse and Friends App seemed to run a lot quicker and the children were able to get started straight away, which engaged their attention (you do not need the original native OSMO app already installed for this to run, just the hardware). You are asked if you want to set up an account to be able to save your progress and pictures, this is advisable (if you have 10 minutes to spare while your child is otherwise occupied!) - if you already have an OSMO account, use those details to sign in. The idea behind this simple app is to use the camera to capture real time drawings. The app is very easy to follow, giving verbal and pictorial instructions to the user as they travel through a story using the different pages in the Sketchpad. My 6 year old found it immediately entertaining and fun and could understand what she had to do straight away. What does it teach kids? The Super Studio first and foremost encourages childrens' creativity and improves fine motor skills and artistic skill, while providing a set of characters so familiar, there is no doubt an added level of excitement. In using the product, children will also learn how to draw these Disney characters freehand. You could also argue that it is helpful in getting children to learn how to follow instructions, as some of the 'sketch' areas on each page need to be done in a specific order, because the app will only capture them in a specific order. 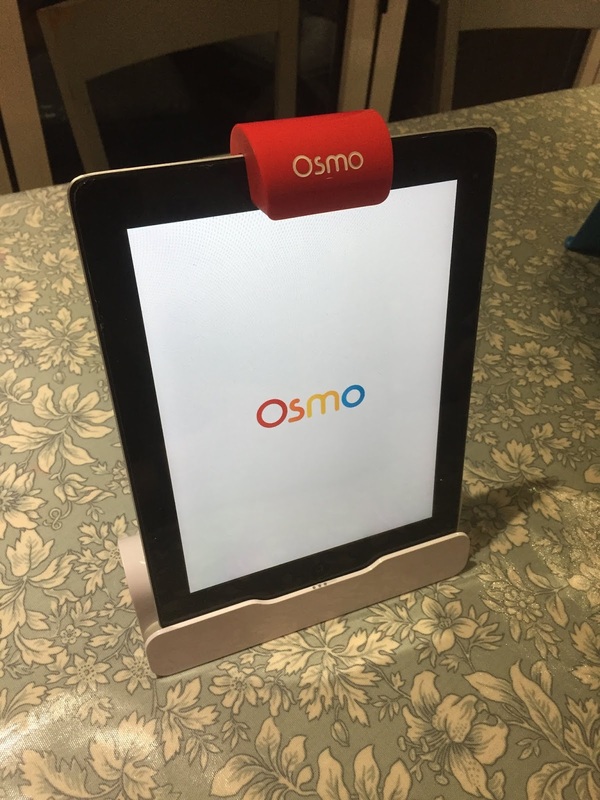 In terms of tech, OSMO demonstrates how it can use the camera as a way of inputting data, storing it, then manipulating it and outputting it back through the screen. In other words, this is an excellent basic introduction to how Computer Generated Imagery (CGI) works, and how cartoons and animations are brought to life by artists using computers. 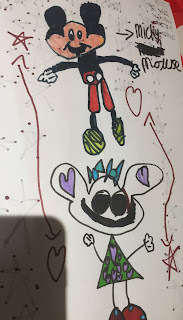 My children were delighted to see their drawings come to life on the screen, and be used in the interactive 'cartoon' that is being played out through the app. I believe it is a really smart move by OSMO to include these well loved characters and combine it with their interactive art product. It hooks children in because they see familiar things that are already drawn and animated, which they then get to re-draw, re-shape, re-colour and see animated before their eyes. It has certainly encouraged my children to then go on to create these characters freehand when not on the iPad (as shown here!). You will require either headphones or a quiet space for your child as they use this, as the app it not only full of music and sound effects, but dependent on the sound to give instructions. This is a physically well-made product and a fantastic smooth-running app. It is easy to set up and provides creative and interactive screen time. It is a good introduction into animation and CGI and providing you can talk to you children about it, a good demonstration of the input/ storage/ manipulation/ output of data.